Urumi, a Malayalam historical film released last year was set in 1502 CE, the year Vasco da Gama made his second voyage to India. The turning point in that movie is when Gama captures Miri- a ship filled with pilgrims returning from Mecca- off the coast of Kerala and barbarically murders 300 Muslims including women and children over five days. The rest of the movie is about how one of the boys, whose father was killed in that attack, gets his revenge during Gama’s third and final voyage. Though the movie was a work of fiction, filled with historical inaccuracies, it brought to attention an important point: Gama had an agenda much bigger than finding a new trading route. Nigel Cliff’s book expands on that less mentioned detail. He argues that Gama was serving the apocalyptic agenda of King Manuel who wanted to find the Eastern Christians, destroy the power of Islam, and lead Portugal in conquering Jerusalem. This was essential for the Second Coming and the Last Judgement that was to follow. The voyage to Kerala was just one step in this plan. To understand the primary motivation behind Gama’s dangerous voyage circumnavigating Africa and across the Indian Ocean, we have to understand the state of the world in the 15th century. Portugal was ruled by a religious fanatic whose wedding gift to his wife was the expulsion of the Jews settled in Portugal. Since the year 1500 was approaching, he thought the apocalypse was around the corner and he had to conquer Jerusalem. Since Portugal neither had the wealth nor the power for such a task, the plan was to acquire wealth by entering the lucrative spice trade and gain power by forming an alliance with the Eastern Christians. Once the Islamic power was weakened- by eliminating them from the spice trade- the troops could march to Jerusalem and capture the Holy Land. The Portuguese knew that India was a rich place from where all the spices came. They also knew that it was the home of Prester John, a supposedly Christian king who had unlimited precious metals and a vast army at his disposal. Once the alliance was formed with the Eastern Christians and their rich and powerful king, the march to Jerusalem would be the next logical step. To put context into this obsession with capturing Jerusalem, Cliff starts off by examining the relation between Islam and Christianity. As a reaction to the violent expansion of Islam from the 8th century till the 10th, the Pope authorised the Crusades to recapture Jerusalem, which went on for centuries. The Crusades had to be halted following the Mongol invasion and the Black Death that followed, but the feelings behind them never really died out. Those feeling were revived following the fall of Constantinople, Christendom’s glorious city, and something had to be done urgently. For that Vasco da Gama set off to find a new route to India bearing the Crusader’s Cross- the one used by the Knights Templar- as his flag. Disrupting the spice trade was not the first trick the Portuguese tried. After building a naval fleet, they conducted raiding missions down the coast of Africa, planting crosses wherever they landed. When that failed to yield sufficient revenues, they ventured into slave trade. Since this was a war against the Infidels and the unbelievers, it got the stamp of approval from the Pope who issues various Papal bulls and went so far as to divide the world between Portugal and Spain so that peace is maintained between the colonisers. After a terrifying voyage, Vasco da Gama’s fleet reached Calicut where he found a large number of Muslim traders. He also observed that the ruler belonged to some other religion. By his worldview- in which he had never encountered Hindus- Gama assumed that naturally the Zamorin had to be Christian. But the Zamorin was unimpressed by Gama and the gifts he bought. Gama kept away from the Muslims to be safe, but eventually was disappointed on two counts. First he assumed that the Eastern Christians would be delighted to see their Western counterparts and the united front would expel the Muslims. Second, he thought that Indians would hand over the spices in exchange for the trinkets they had bought but compared to the richness of Calicut, Gama looked like a beggar. Gama in turn blamed his failure on the Muslims, displayed some basic brutality, and returned back to Portugal where he was received as a hero. Though Gama did not bring back spices or find Prester John, his voyage sent shock waves across Europe. Manuel wanted to ride on this wave of success and sent another mission under Pedro Cabral with a strong warning for the Muslim traders. Cabral wanted the Zamorin to expel all the Muslims traders or face the wrath of the empire. When their demands were not met, the Portuguese went on a rampage. The destroyed the Arab ships in the port and fired shots at the Zamorin’s palace causing him to flee. A later mission under Joao da Nova escalated the religious war and went back without much progress. 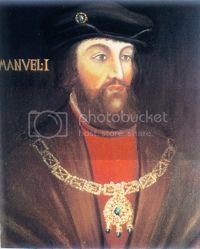 Manuel needed a strong willed captain who would force the Indians into submission and for that Vasco da Gama was pressed into service once again and it resulted in the Miri incident. This time the action was not to be restricted to the Malabar coast. Once force was used to subdue the Indians, the fleet would split into two. One part of the fleet would enforce a blockade of the Arab shipping to the Red Sea area and cripple Egypt’s economy. After Egypt was weakened, the Portuguese would sail up the Red Sea and meet land troops who would have marched across Egypt; together they would conquer Jerusalem. But this plan did not work quite as expected. Gama once again asked his old nemesis, the Zamorin, to expel the Muslims and yet again the Zamorin refused to comply to the Portuguese pirates. An irate Gama went around hanging Muslims and firing cannons towards the coast. The dead people were mutilated and sent on boats off to the shore as a part of the shock and awe strategy. The Portuguese strength came from their naval superiority and since they did not have sufficient strength to fight the Zamorin’s troops, they left. This voyage was considered a great success compared to the others. The next captain Francisco Alameda, dispensed with the niceties completely and precipitated such a crisis which resulted in major naval battle in the Arabian Sea. After attacking various African countries and butchering people there, Alameda reached Calicut. Remembering the Passion of Christ and motivated by a rousing speech by a priest, the Portuguese attacked Calicut leaving around 3600 dead. Meanwhile another Portuguese fleet cut off the Egyptian supply chain. Based in Muscat, they terrorised all around and took control over the Western destination ports of the Arab ships. The Egyptians, whose business was seriously affected, sent a fleet to the Indian Ocean which defeated the Portuguese, the first naval defeat for them in the Ocean. But the Egyptians were no match for the Portuguese; they scored and easy victory over them as well over the Zamorin and finally a fortress was built in Calicut. It looked as if Jerusalem was within grasp.In fact Manuel sent a fleet towards the Suez, but they came back without attacking Jerusalem. Once Goa became a lucrative market for the Portuguese, they were more interested in settling down and plundering the region by enforcing a pass system. Matters like forced conversions and setting up the Inquisition became more important than capturing Jerusalem. Though the Malabar coast has been part of a global maritime network since the Roman empire, there was an explosion of trade since 1000 CE due to improved navigational aids, better ship building, better map making and new legal arrangements. Places like Quilon (Kollam), Melaka, Quanzhou, Futsat and Aden became the nerve centers of this network where people and goods moved with ease. According to Manmadhan Ullattil who wrote about the Hubs of the medieval trade (Pragati, June 2009), the arrival of the Portuguese changed the rules of the game as they used force to control trade and establish monopolies. John Keay in “India: A History” has few lines about the Portuguese and Vasco da Gama; he mentions that when Portugal declared a Viceroy for India, it betrayed the true nature of their ambition. “Worlds Together, Worlds Apart: A History of the World: From 1000 CE to the Present” (Third Edition) (Vol. 2) by Robert Tignor et. al which is used to teach world history at Princeton University, describes the Portuguese brutality in the Malabar coast. But both these books fail to make a connection between the Portuguese voyages to India and the Crusades. Cliff makes a valuable contribution by putting the piety and plunder of the spice trader into a global context.